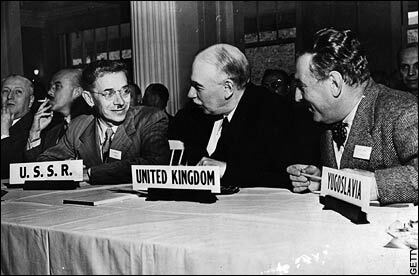 The Bretton Woods Conference in 1944 gave birth to the post-war economic order of endless growth. The 2011 re-play gave more of the same. As I listened to videos of the “experts” speaking at what was billed as the Second Bretton Woods Conference held near my home in New Hampshire earlier this month, one thought crossed my mind. Economists appear to be more interested in impressing their peers than in discussing issues with lay people. Thus, if you’re an average person attending a conference where economists are speaking, you’ll need a dictionary handy when they’re talking, and maybe a translator. Aside from impressing their peers, the economists may also be trying to show that this stuff is too complicated for the average citizen. That implies we should leave it all to them. But the track record of economists over the past 30 years doesn’t justify that confidence. Life is complicated, but you don’t need a PhD in economics to figure it out, nor do you need computer models or charts. Fact #1 — You can’t have infinite growth on a finite planet. Only fools and economists think otherwise. As demand exceeds supply, resource shortages, especially oil shortages, start to appear. It’s time that the word “limits” becomes part of our vocabulary. Fact #2 — Energy is the ability to do work. Thus, the more energy you have, the more work you can do. Growing economies need more energy, and when that energy becomes scarce or expensive, then economies stop growing. Fact #3 — Future growth is the collateral for all today’s public and private debt. Yet, if fact #2 applies, there may not be future growth. What happens to all the debt? What happens to our future? Fact #4 — We have accepted the premise that growth is the answer to all our problems, never considering that growth is the problem. We need a new paradigm. Fact #5 — We ‘ve ignored the law of diminishing returns, and we do so at our own peril. Consider the issue of how much GDP growth we get for how much debt. In 1969, one dollar of total debt, public and private, returned 94 cents in GDP growth. By 2005-2007, it now took $5 in total debt to generate the same dollar in GDP growth. Looking at GDP growth in 2010 and the trillions in government debt, have we reached a negative return? Will the cost of borrowing the debt exceed the return in GDP growth? Fact #6 — There are other laws we should know, such as the law of supply and demand and even Leibig’s Law or the “law of the minimum,” which comes from farming and says that growth is controlled not by the total resources available but only by the most limited resource needed. The disaster in Japan has crippled many parts manufacturers, who supplied vital components to the end product (cars for instance). Without those parts the assembly line stops. Government tries to negate these laws, and may appear to initially succeed, but will ultimately fail. Fact #7 — Complexity breeds its own Black Swans. As shown in #6, in an interconnected and interdependent world, seemingly unrelated events around the world can have far-reaching effects. Our world is nonlinear. There are more, but you get the idea. As you apply these to problems, many other questions will arise. Before you know it, you have a much clearer understanding of what is going on. This is not rocket science. Don’t assume the “experts” can figure it out better than you. They can’t! An excellent article, explains in all simply. But you forgot the 1st rule of economists, get as much money for themselves and their friends and to hell with everybody else. Remember being rich is important only if everybody else has nothing. Other wise we are all the same. But the rich forget that WTSHTF they will be in worse shape than anybody. Do you think that Trump, the Kocks, or any of the uber rich know how to grow food, or take care of themselves in any meaningful way. Not a chance. We the working poor have been having to get along on our own for a long time. Recently saw the movie “Inside Job.” If you haven’t seen it, and it is playing in your neighborhood, take the time to see it. We now have a government that only serves the interest of the top 1-2%of the population, and they serve them at our expense. Have we become so indifferent to our future that we ignore that? Where is the outrage?